viaLibri ~ Principatus Silesiae Wratislaviensis. Artist: Homann Erben (d) ; issued in: Nuremberg; date: (d)1736 - - technic: Copper print; - colorit: original colored; - condition: Upper Left margin perfectly replaced; - size (in cm): 56 x 82; - description: Beautiful dekorativ map shows the area of Breslau in lower Silesia with beautifl herladic cartouche and an index of the map; - vita of the artist: Johann Babtiste Homann (1664-1724) was born in Oberkammlach, the Electorate of Bavaria. Although educated at a Jesuit school, and preparing for an ecclesiastical career, he eventually converted to Protestantism and from 1687 worked as a civil law notary in Nuremberg. He soon turned to engraving and cartography; in 1702 he founded his own publishing house.Homann acquired renown as a leading German cartographer, and in 1715 was appointed Imperial Geographer by Emperor Charles VI. Giving such privileges to individuals was an added right that the Holy Roman Emperor enjoyed. In the same year he was also named a member of the Prussian Academy of Sciences in Berlin. 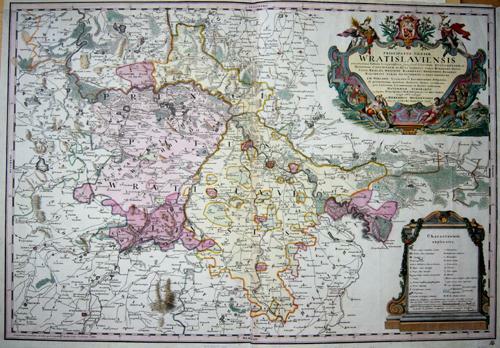 Of particular significance to cartography were the imperial printing privileges (Latin: privilegia impressoria). These protected for a time the authors in all scientific fields such as printers, copper engravers, map makers and publishers. They were also very important as a recommendation for potential customers.In 1716 Homann published his masterpiece Grosser Atlas ueber die ganze Welt (Grand Atlas of all the World). Numerous maps were drawn up in cooperation with the engraver Christoph Weigel the Elder, who also published Siebmachers Wappenbuch.Homann died in Nuremberg. He was succeeded by the Homann heirs company, which was in business until 1848. The company was known as Homann Erben, Homanniani Heredes, or Heritiers de Homann abroad.